There's been a flurry of blogs recently about using JAX-RS. It may have slipped under the radar a little, but WebLogic Server 10.3.4 now also provides support for deploying applications that use JAX-RS Web Services. With WebLogic Server, the JAX-RS support is handled in the same manner as JSF, in that a set of optional shared-libraries are provided that can be deployed to the server, which makes the JAX-RS framework available for deployed applications to use. Applications then reference these shared-libraries using the relevant weblogic deployment descriptor. What I'd like to do in this blog is to show JAX-RS working on WebLogic Server 10.3.4 and at the same time, how the NetBeans 7.0 Beta release supports WebLogic Server to make the development of JAX-RS based applications quick and efficient by removing some of the work required in deploying and referencing the libraries. .
1. 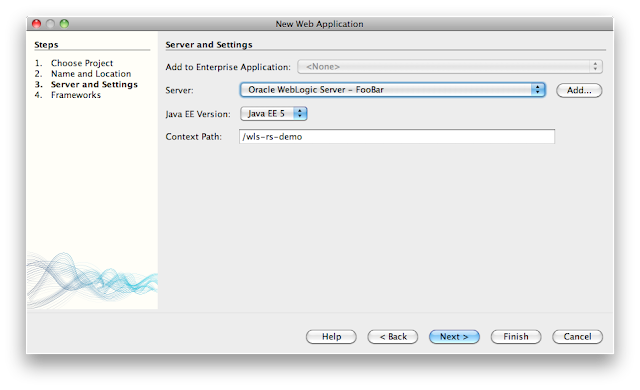 Launch NetBeans and register a WebLogic Server 10.3.4 instance. I won't go through the individual steps as this is very straight forward. 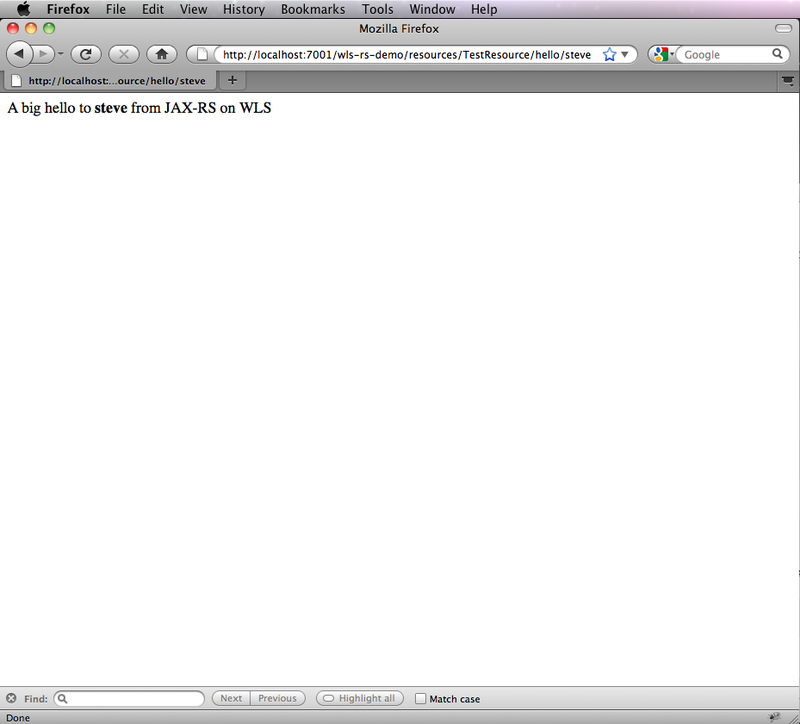 In my particular case, I have a brand new domain I am using, so there are no applications or shared-libraries deployed. 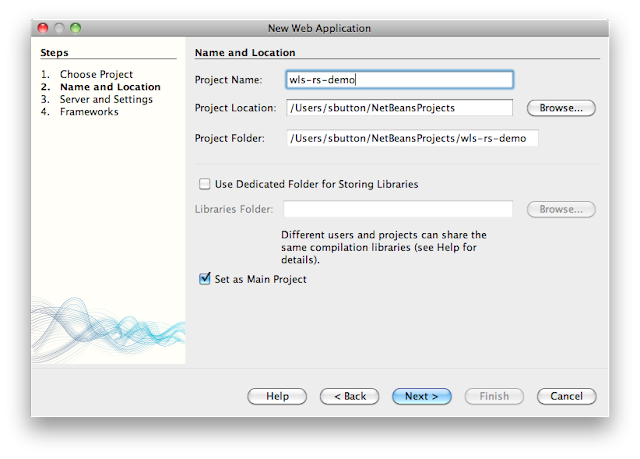 The next step is to create a new Java EE Web project using the NetBeans project wizards. This project will host our JAX-RS resource and is what we will deploy and test on WebLogic Server. Create a new Java Web Project and fill in the project details. For the Server, I specify the WebLogic Server domain that I registered earlier, leave the Context-Path and finish the project creation and click finish to create the new project. 3. Add a JAX-RS resource to the project. With the Java Web project created, I can now add a new JAX-RS resource to it, again using a NetBeans wizard -- the simplest way to test this is to use the "RESTful Web Services from Patterns" wizard and select the "Simple Root Resource"option. Select the “Simple Root Resource” option. Fill in the details for the resource to be created. In this case, I am specifying a MIME Type of "text/html" to make the default end point easy to test from a browser. On the last page of the wizard, I am presented with options for how to configure the project. 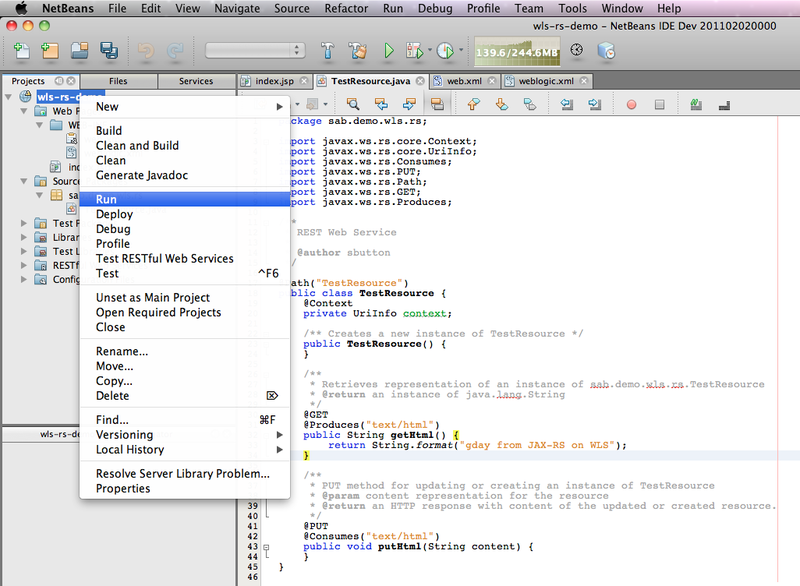 NetBeans has knowledge of how WebLogic Server employs JAX-RS and presents them to you. 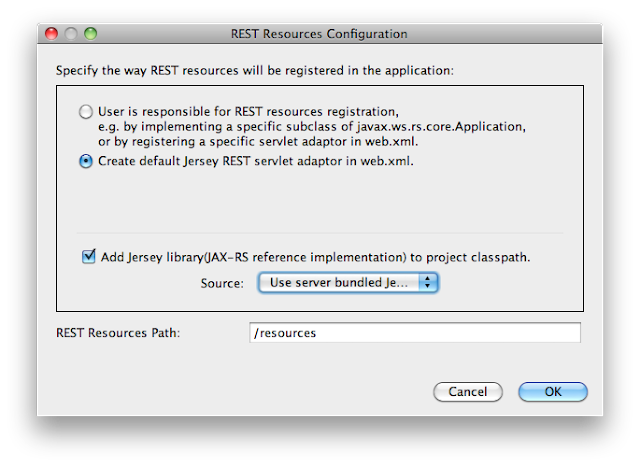 I select the option to have NetBeans automatically configure the JAX-RS servlet adapter in web.xml and then I select the "Use server bundled Jersey Library" option. The JAX-RS resource is then created and added to the project. 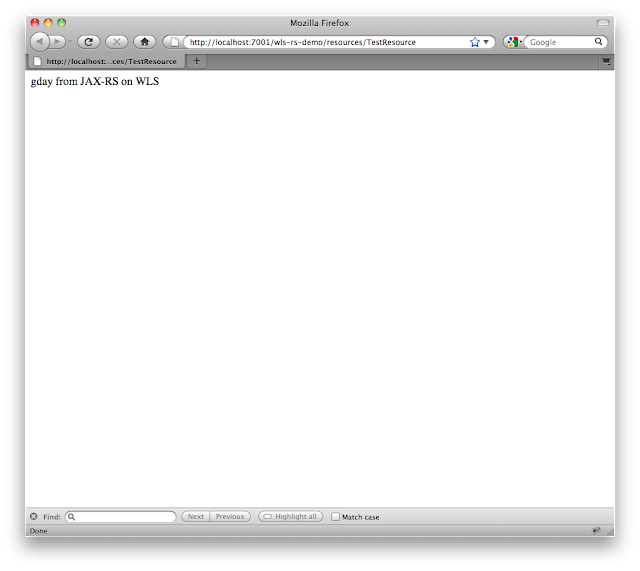 The existing web.xml descriptor has been modified to expose the Jersey Servlet adapter. A new weblogic.xml deployment descriptor has been added, which references the required JAX-RS shared-library that will be deployed on the server. And a new class has been added that represents the JAX-RS resource. After editing the generated getHtml method to return a string I'll recognize, the project is ready to be deployed and tested. 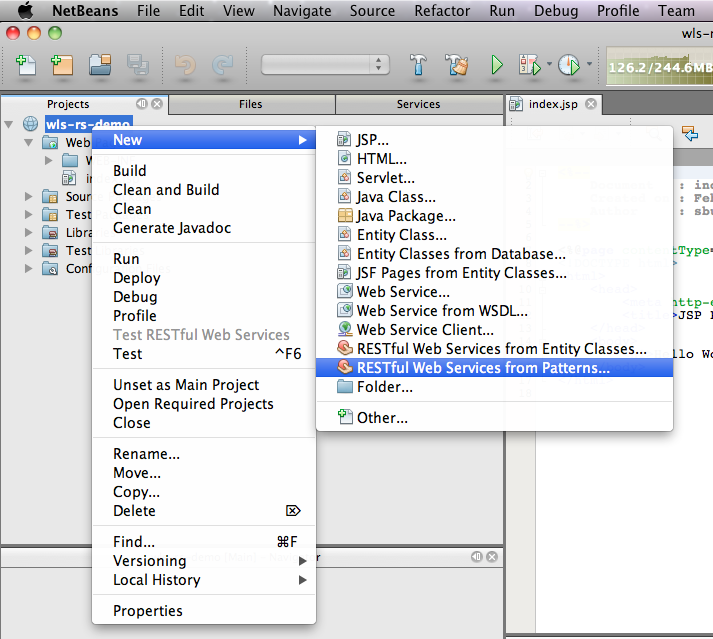 Selecting "Run" from the project menu, NetBeans will perform the task of compiling and deploying the project to the target WebLogic Server domain. NetBeans performs the necessary deployment operations. Now the interesting thing that happens as part of this "run" process (and why it takes 27 seconds most likely) is that NetBeans has recognized that the target WebLogic Server domain doesn't have the necessary shared-library that the project is using. To resolve this problem, it seamlessly deploys the required library from the $WL_HOME/common/deployable-libraries directory as part of the deployment process. 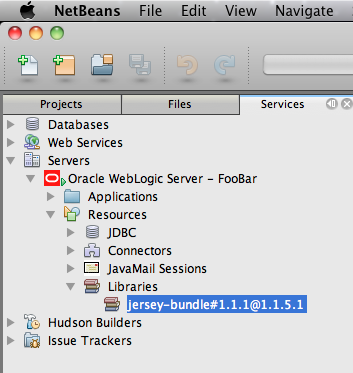 Once the deployment of the project has completed, looking at the registered WebLogic Server domain, I can now see the jersey-bundle#1.1.1@1.1.5.1 library present on the server. We can now test the JAX-RS resource. Expanding the project, there is a "RESTful Web Services" folder that presents a view of the JAX-RS resources in the project. 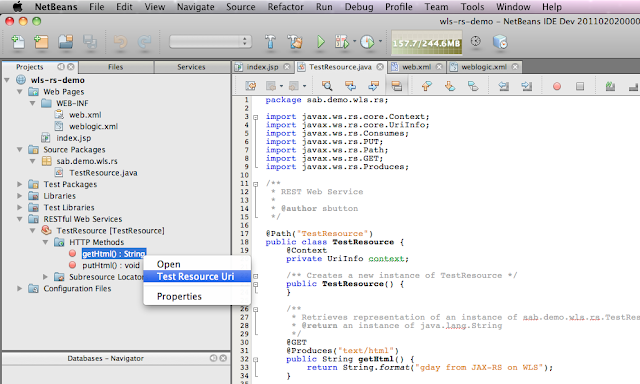 To test the end-point, I select the method and click the "Test Resource URI" option. 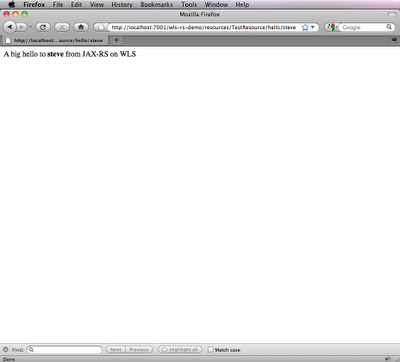 This opens a browser window and shows the results of successfully calling the getHtml method. So there you have it, a JAX-RS resource created in NetBeans, deployed and running on WebLogic Server 10.3.4. 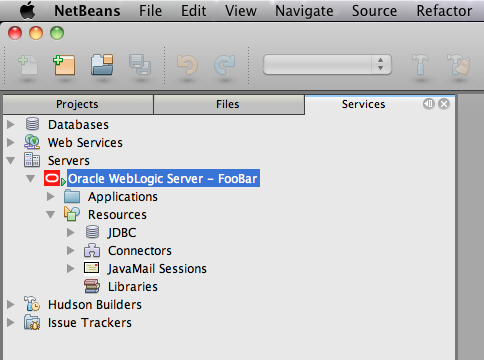 As a final piece to add to this blog, I'll also show off another new feature that NetBeans 7.0 has added to further support WebLogic Server. The new "local deployment" model deploys applications from an exploded, local directory. This means that deployment to WebLogic Server is now much better since a code change doesn't require a full packaging and "deployment" cycle to test. In fact, using NetBeans with WebLogic Server nows offer compile-on-save and test functionality! 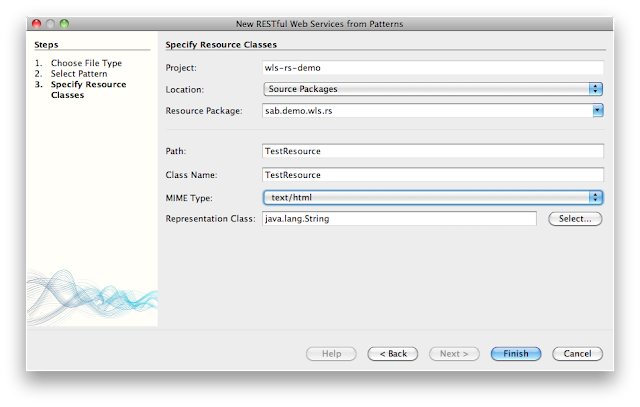 With the application deployed, I can now change the class to add more functionality. I'll add two new methods that sayHello and sayBye to a user. In these methods, I'll use the @PathParam and @QueryParam annotations respectively to extract the value from the URI and set it automatically on the method call. 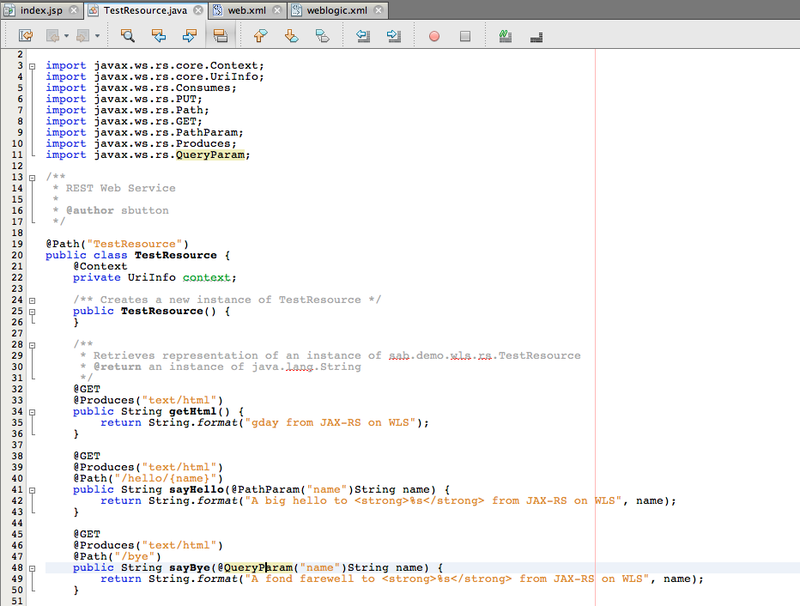 To test these new methods, all I need to do is save the change, NetBeans automatically compiles the class and I can immediately test if from the browser, without needing to issue a redeployment operation! And that's all there is to getting a basic JAX-RS resource up and running on WebLogic Server, developed and deployed in next to no time using NetBeans 7.0. Hi, Nice and helpful post. 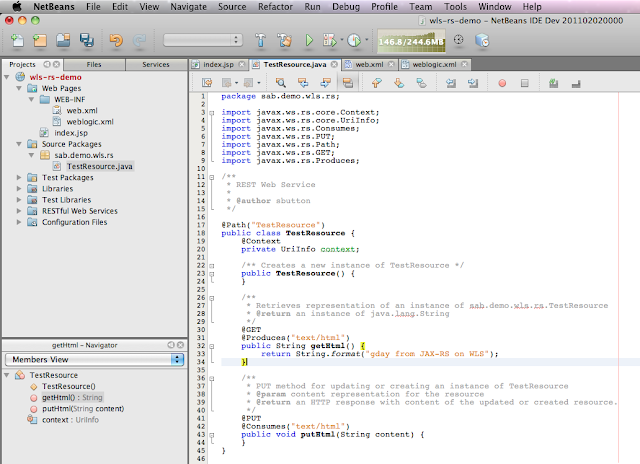 I would like to add a link to your post and blog on netbeans.org. I hope that is ok.